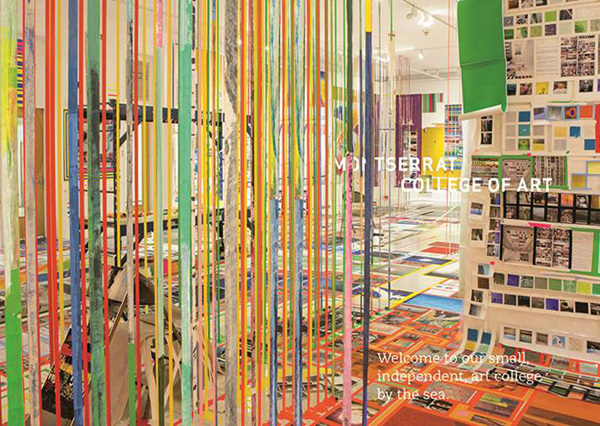 The Monsterrat College of Art Viewbook, printed by Franklin Printing, used offset 5 colors (CMYK +PMS match), stamped with a clear foil on the cover and perfect bound by Superior Finishing. It was printed on Colorplan 270gsm Cool Blue, Natural, White Frost and Pale Grey. The designers, Jan Moscowitz, Eric Lee and Jeffrey Newell from Studio laPlancha, were inspired by the Montserrat, a college of creativity. They wanted to design the book with full strong colors throughout the inside, and minimal, clean and fresh, "barely there" colors on the cover. Artists, and by default, art schools, love the properties of paper. There is no other medium that would substitute for ink on paper. Montserrat College of Art is a small learning community for students deeply engaged in art and design in Berverly, Mass. The white covers of the admission catalog represents an escape to the sea, as Montserrat College is for many students.